Fight Night Champion will be the first ever “Rated M” title developed by EA Sports. That explicit nature and brutality will be represented not just through bloody fights but also with what is being described as mature content found in the “lifestyle and culture of boxing”. This news could be encouraging or worrisome depending on how it’s looked at. The game will also include improved punch controls and one-punch knockouts, physics-based gameplay, and expanded online play modes. Continue on for an early list of features but given that the game is still a ways out from a March 1st release date there is still much in the way of details to come on the game and its feature set. Control your boxer’s punches with precision and accuracy like never before with a new synergy of gameplay controls. From overhand punches to strategic counter jabs and one-punch knockouts, overwhelm your opponents with your refined skill set. Move around the ring and time your attacks with precision. Building off the best-in-class gameplay engine featured in Fight Night Round 4, you now have an even wider range of abilities when it comes to counterattacks, setting up combos, and attacking your opponent. Create your alter ego and put him in the ring against past champions. Work your way up the ranks through training and scheduled bouts, and establish your name as the fighter to beat. Take your boxer online and see how you size up against the best in the world competing for local or worldwide belts in the all-new Fight Night Nation. Create an online gym with your friends and battle it out to see who’s the ultimate champion, or turn boxing into a team sport and challenge other gyms in Rival Matches to unlock items, win trophies, and more. 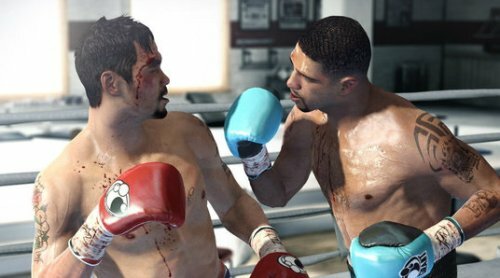 As the first-ever ‘M’ rated EA SPORTS title, Fight Night Champion showcases the truest graphical representation of the sport, lifestyle, and culture of boxing with authentic and dynamic blood, realistic body damage and deformation, and mature content throughout. Experience the violence and brutality that is true to the trade.